Personal information we collect about you: We may automatically collect the following personal information: our web servers store as standard details of your browser and operating system, the website from which you visit our website, the pages that you visit on our website, the date of your visit, and, for security reasons, e.g. to identify attacks on our website, the Internet protocol (IP) address assigned to you by your internet service. 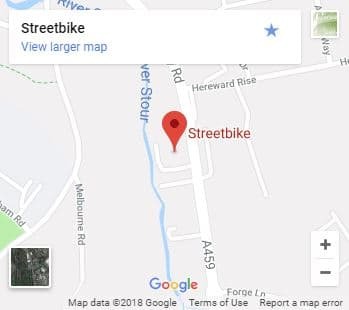 We collect some of this information using cookies – please see https://www.streetbike.co.uk/cookie-policy/ for further information. We may also collect any personal information which you allow to be shared that is part of your public profile on a third party social network. 4.7 If documents are handed over with a part exchange or a vehicle brought into stock from elsewhere we will keep these documents with the vehicle to help evidence the history of the vehicle. This is a legitimate interest not only for us and any new owner but for the wider market regarding fraud prevention and safety. We may transfer your personal information to a third party as part of a sale of some or all of our business and assets to any third party or as part of any business restructuring or reorganisation. We may also transfer your personal information if we’re under a duty to disclose or share it in order to comply with any legal obligation (e.g. by sharing your personal information with the DVLA or DVSA or the police), to detect or report a crime, to enforce or apply the terms of our contracts or to protect the rights, property or safety of our visitors and customers.